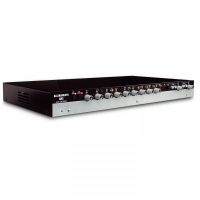 The MX152 is a one-half rack space, two microphone and three stereo source mixer. The unit provides a compact and efficient way to mix sources such as AM/FM tuners, CD players, and video players with dynamic or condenser microphones. Applications include background music and paging for small clubs, churches, schools, restaurants, etc. Each microphone channel has a Level and Tone control. Sources One and Two have Level adjustments and pass through combined Bass and Treble controls. Source Three has a Level adjustment only. The Microphone inputs are balanced XLR jacks, all Source inputs are stereo RCA except for the front 1/8 jack on CH3 for an MP3 player, etc. The main output is stereo RCA. An included 12VAC adapter (Rolls PS12) provides power to the unit. A series of six DIP switches provide important features to the MX152. Two switches apply the 12VDC of phantom power to the individual Microphone Inputs. A second switch sums the program material of Source Three to mono, and a third sums the overall output to mono. Another switch provides priority ducking to Source Three input allowing that channel to mute the other source inputs for use with a jukebox. The final switch configures Microphone Input One as a paging input, ducking the other microphone and Sources One and Two.